Preheat oven to 400°F. Wash and scrub potatoes. Slice each potato into ¼” thick rounds, discarding the ends. Toss the sliced potatoes in a large bowl with 1 tablespoon olive oil, salt and pepper until the potatoes are all well coated. Line them on a baking sheet so that each have their own space and are not touching. Roast in the oven for 10 minutes, flip and roast for an additional 5-8 minutes, or until each side is golden brown. Remove from the oven and set aside to cool. Slice the pre-cooked bratwurst into 1/4” thick rounds. In a non-stick sauté pan, heat the additional teaspoon of olive oil over medium high heat. Add the sausage rounds and sear until they are browned on both sides. Arrange the potato rounds onto the platter you will be using to serve them. 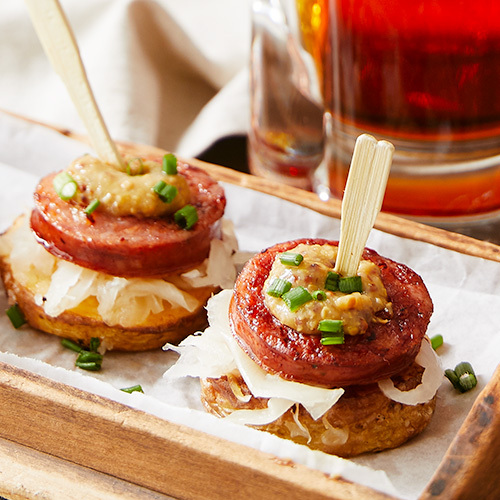 Top each with approximately one tablespoon of sauerkraut, one slice of sausage and a dollop of Maine Craft Ale Mustard. Sprinkle with fresh chopped chives for garnish if desired and serve with toothpicks.